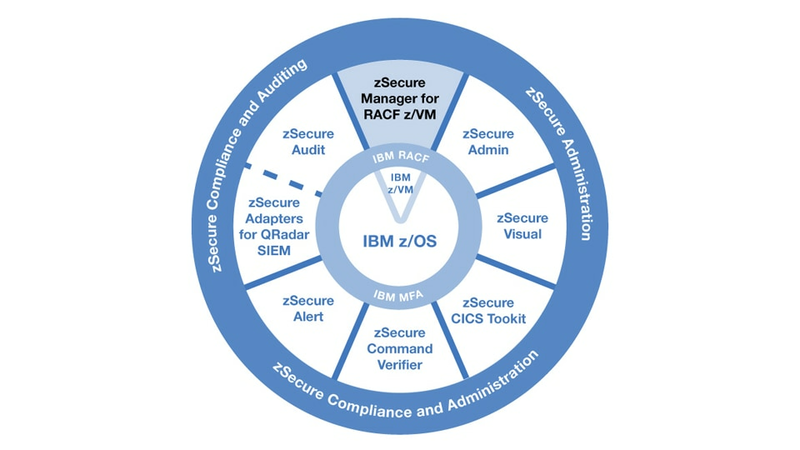 IBM® Security zSecure™ Manager for Resource Access Control Facility (RACF®) z/VM® improves administration efficiency and auditing compliance. It automates functions to help you optimize IT resources, mitigate complexity, improve security and quality of service, demonstrates regulatory compliance and reduces errors and costs in virtual machine environments. Enhance user management and provisioning for the IBM z/VM® environment, while you unleash the potential of your mainframe system—enabling efficient and effective RACF administration using fewer resources. Simplify complex security administration tasks using one-step actions that can be performed without extensive RACF knowledge. View vital z/VM information and swiftly identify and fix problems that might require further investigation. Rank issues by audit priority with a number indicating the relative impact of a problem. Merge security rules from different databases: copy or move users, groups, resources, applications or whole databases. Rename IDs within the same database. Perform—when merging—extensive consistency checks and report potential conflicts before generating commands. Create a comprehensive audit trail without substantial manual effort.